Support the development, implementation and embedding of a Solvency II compliant Risk Management Framework. Support the development, implementation and embedding of a Solvency II compliant Actuarial Function which is cost effective, efficient and value-adding. 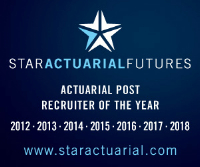 Support the development of reports required under the remit of the Actuarial Function Holder. Assist in ensuring data used within the Actuarial Function is complete, accurate and appropriate. Support the development and embedding of the calculation of the Technical Provisions. Support the completion of the annual ORSA, in particular the stress scenarios.